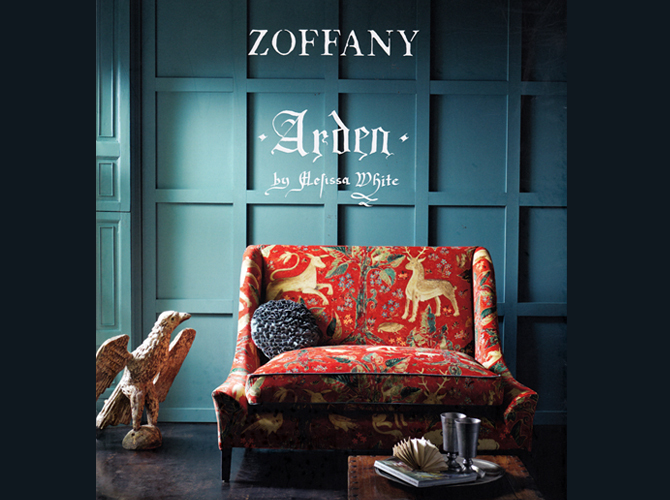 Zoffany, a fine textile company, recently collaborated with artist Melissa White to produce the Arden collection, which is chock full of gorgeous, Elizabethan-inspired textiles and wall coverings. White is a designer and mural artist who specializes in Elizabethan painted decoration, which was very popular during the 16th and 17th centuries. Homeowners would hire local craftsmen to paint these decorations in their homes, which have largely been lost due to tastes and styles changing. Fortunately, some examples of Elizabethan painted decoration have been found during renovation processes or behind paneling. White has used these examples to recreate the designs for private clients as well as public buildings, such as Shakespeare’s Birthplace and several UK museums. Fairlyte is the name of White’s studio, and she has a separate, very informative website to discuss the history of Elizabethan decoration. White talks about the collection itself with UK Home & Garden. 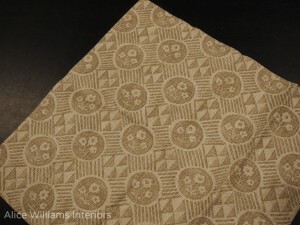 White was apprenticed to David Cutmore, an expert in Elizabethan decoration and design, and they worked closely together until his death in May of 2012. The Arden collection was a collaboration between the two of them. 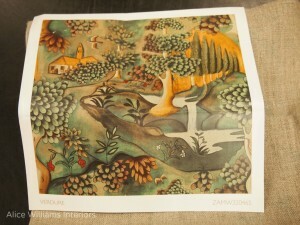 They created the artwork for the collaboration on large plastered canvases with the same techniques used for their private commissions, which include aging, distressing, cracking, rubbing out and washing back, and each hand-painted artwork has been engraved to retain the hand crafted appearance of the originals. The names of the fabrics and wall coverings in the Arden collection are largely derived from the areas and houses in which the original Elizabethan artworks were discovered. The Canterbury pattern, for example, was based on a multivine artwork discovered in a house in Canterbury. The house was demolished years ago, but the painted wall was rescued, restored and put on display in the Museum of Canterbury in 2010. The Saffron Walden Tracery and Border was based on a design discovered in 1924 in the market town of Saffron Walden, Essex. It is an example of what was known is “antickework”: black scrolling designs on a white background. White’s Merchant House Stripe wall covering is taken from—where else?—The Merchant’s House in Marlborough, built in the mid 17th century and owned by silk merchant Thomas Bayly. The original wall painting, which was likely inspired by silk wall hangings from the Netherlands imported by Bayly, can still be seen in the dining room. Existing wall paintings are extremely rare and this one was hidden for centuries before being rediscovered in 1991. 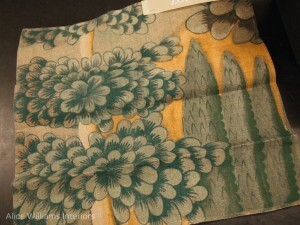 The Verdure design was based on a late 17th century painted cloth found at Owlpen Manor in the Cotswolds. 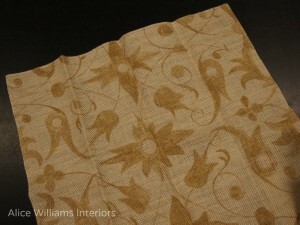 Mille Fleurs is taken from White and Cutmore’s archive, and appears to represent silk hangings with gold thread. 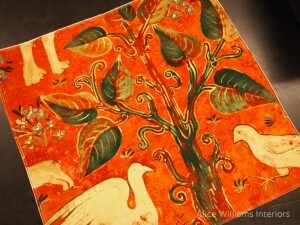 A replica of this design was painted by White and Cutmore at Shakespeare’s Birthplace Museum in Stratford-upon-Avon. 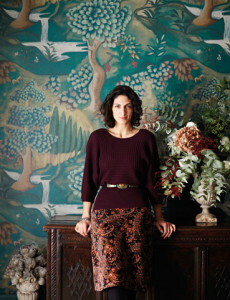 Zoffany has printed it on wide width wall paper and produced the design in a beautiful embroidered fabric. We were so excited to receive our wall covering and fabric memo samples from this collection. 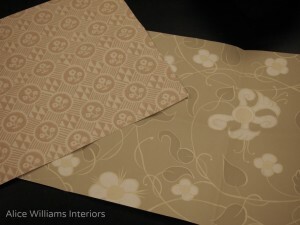 There truly is nothing like experiencing the feel of wall coverings and fabrics in person, and these did not disappoint. There are many gorgeous fabrics and wall coverings in this Zoffany collection, and we hope to find just the right application for them!